Diptera Tabanomorpha of Warsaw and Mazovia. Dolichopodidae (Diptera) of Warsaw and Mazovia. 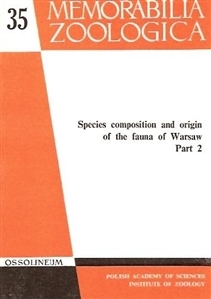 Phoridae (Diptera) of Warsaw and Mazovia. Hover flies (Diptera, Syrphidae) of Warsaw and Mazovia. Conopidae (Diptera) of Warsaw and Mazovia. Pipunculidae (Diptera) of Warsaw and Mazovia. Anthomyidae, Muscidae and non-parasitic Calliphoridae (Calyptrata, Diptera) of Warsaw and Mazovia. Scatophagidae (Diptera) of Warsaw and Mazovia. Calliphoridae parasitica (Diptera) of Warsaw and Mazovia. Sarcophagidae and Rhinophoridae (Diptera) of Warsaw and Mazovia. Tachinid flies (Diptera, Tachinidae) of Warsaw and Mazovia. Gasterophilidae, Hypodermatidae, Oestridae, Hippoboscidae and Nycteribiidae (Diptera) of Warsaw and Mazovia.